In 1938, Swiss chemist Albert Hofmann first synthesized lysergic acid diethylamide, commonly known as LSD. In 1954, a guy by the name of John Lilly invented an isolation tank that was used for sensory deprivation to test the effects of psychoactive agents, primarily LSD. An isolation tank is a chamber filled with salt water that blocks out light and sound, and it also prevents ambient motion. Lilly was trying to isolate the human mind from external stimuli to truly test the effects of LSD on the human brain. That was a decade before the infamous Electric Kool-Aid Acid Tests of the mid-to-late ’60s. That was one hell of a trip. Today, isolation tanks are used for more therapeutic purposes. These mechanisms have been discovered to reduce cortisol levels in the body, which brings down stress and pain levels, while increasing recovery times. If there are any human bodies that can benefit from this level of therapy, it’s those of mixed martial artists. 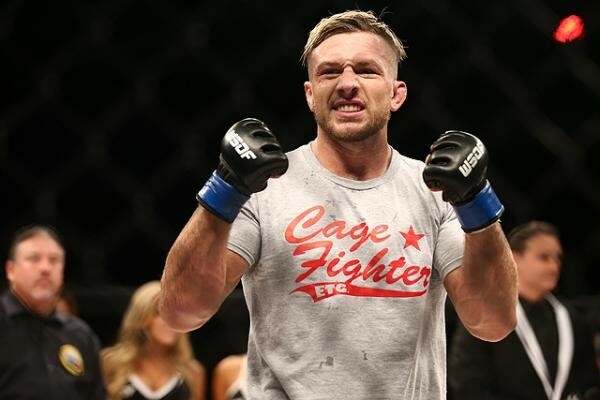 World Series of Fighting featherweight champion Lance Palmer knows a thing or two about the need to recover. The four-time NCAA Division I All-American wrestler has been a competitive athlete for most of his life. Wrestling, like MMA, is a sport in which recovery is crucial and stress can be high. Most fighters are so amped up during fight camps that they do not realize the toll they are taking on both body and mind. Cortisol, which is the stress hormone, can have adverse effects on recovery and weight loss, both of which are keys to a successful fight camp. Isolation tanks are just one tool in the belt that Palmer recently won at WSOF 16 back in December. The former wrestler is a member of Team Alpha Male in Sacramento, Calif., so he trains under great coaches, and his training partners are some of the best fighters in the world. Palmer’s WSOF featherweight title was the second current major title that was brought back to Sac-town. He attributes the championship win to the rounding out of his MMA skills at Alpha Male. While utilizing his technique was part of it, there is another underlying force that Palmer knows is crucial to being a world champion. In 2013, another arrow dropped into his quiver in the form of UFC veteran Duane “Bang” Ludwig. During his short tenure as the head coach of Team Alpha Male for 2013 and part of 2014, Ludwig made a huge impact in the lives of all of the Alpha Male fighters. Ever since Ludwig moved back to his hometown of Denver to open his own gym, the Alpha Male guys have been making trips out to train with their former head coach. While Denver was fun times, Palmer’s last win was an absolute war. He took on incumbent champ Rick Glenn to finish out the year, and they battled all the way into the third round. Glenn is a very tough guy, and Palmer’s next opponent is no different. Friday night at WSOF 21, Palmer will face young vet Chris Horodecki. The Canadian fighter is 27 years old, holds a 21-5-1 record as a pro, and trained under the late Shawn Tompkins. He is a well-rounded fighter who has won in all possible fashions. “With Horodecki, I’ve just been training to put on the best performance,” admitted Palmer. “I just need to go out there and keep performing at what I’m best at, and I want to open up and show off all of my tools. Palmer has a champion mindset as he looks to retain his belt at WSOF 21 tomorrow night. He’s got his eyes on the prize, and he is looking to continue his successful career with WSOF into the immediate future. After this one, he will definitely be ready for a swim in the isolation tank. Then, it’s back to training.